GC students Kiernan Wright, a junior from Orrville, Ohio, Sam Carlson, a junior from Goshen, and Jessica Davila, a junior from Goshen, are serving at the Wi’am Conflict Resolution Center in Bethlehem this summer. When Sam Carlson walks to work in the morning, he steps over hundreds of tear gas canisters, stun grenades and smoke bombs. Sometimes, he can feel tear gas lingering in the air. Carlson, a junior peace, justice and conflict studies (PJCS) major from Goshen, is serving at the Palestinian Conflict Resolution Center (Wi’am) in Bethlehem, Palestine this summer. After making the decision to spend the summer in Palestine, he was accepted into Goshen College’s Service Inquiry Program, which offers students the opportunity to serve with a church-related service or mission agency. Carlson is serving in Bethlehem along with Jessica Davila, a junior from Goshen, and Kiernan Wright, a junior from Orrville, Ohio. Clare Maxwell, a 2013 graduate, also served alongside them until her return in June. Bethlehem is in the West Bank, a territory to the east of Israel that is home to more than two million Palestinians. The West Bank is occupied by Israel and enclosed by a separation barrier that restricts Palestinian movement. Although the region has been in the news a lot recently, the West Bank is separate from Gaza, a strip of land to the west of Israel, where there is heavy fighting between the Israeli army and Hamas. The conflict has caused more than 1,300 Palestinian deaths, most of them civilians, and more than 50 Israeli deaths, according to the United Nations. 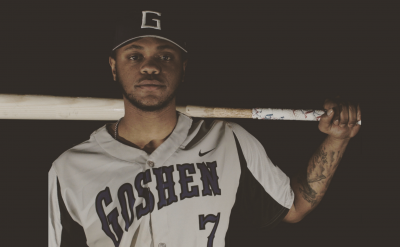 Though Goshen College does not encourage students to visit dangerous locations, the GC students arrived during a period of relative calm between the two states, before tensions escalated in June. Carlson, who has lived in the heart of Bethlehem since the end of May, has witnessed nonviolent protests broken up by tear gas and stun grenades. He said the conflict has become increasingly violent during his time in the West Bank. Carlson works as a children’s camp counselor at Wi’am, which works to resolve disputes within the Palestinian community through traditional Arab mediation as well as Western models of conflict resolution. During his first week at the summer camp, two days were cut short by nearby fighting. 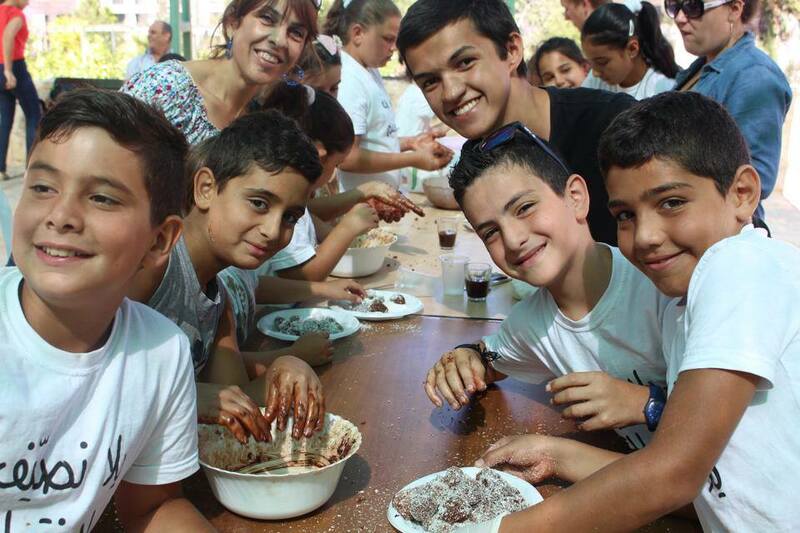 Sam Carlson works with Palestinian children at the Wi’am summer camp in Bethlehem. Like most Americans, Carlson had never encountered tear gas before. Davila said that it has been a transformative experience to see the frustration, pain and sadness the Palestinians experience as the conflict becomes increasingly violent. 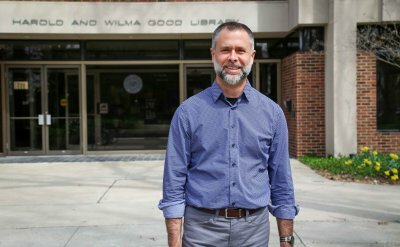 Carlson decided to visit Palestine with the Service Inquiry Program in order to gain first-hand experience in two of his passions: nonviolent social change and the Arabic language. 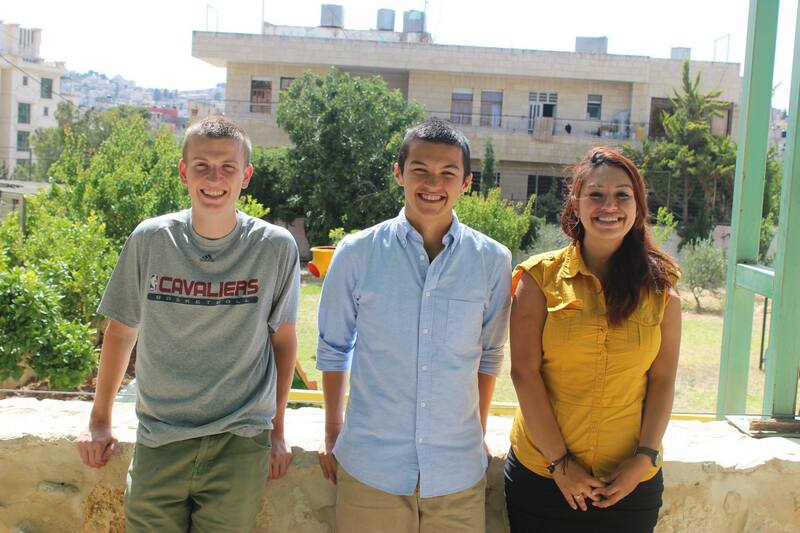 Carlson, Davila and Wright are among about a dozen Goshen College students who have come to Palestine in the last few summers at the encouragement of Marcelle Zoughbi, a 2013 GC graduate and a Christian from Bethlehem, whose father is founder and director at Wi’am. Carlson and Wright work at Wi’am’s summer camp as children’s counselors. This involves planning and facilitating daily activities, which include arts and crafts, singing, organized sports and dabkeh—a traditional Palestinian dance. When the camp is not in session, Carlson and Wright write grant proposals for Wi’am. Davila has volunteered at Le Crèche, a Christian orphanage, and served on the medical team at Caritas Baby Hospital, which provides medical assistance to about 35,000 children. Carlson said he has learned a lot about the Israel-Palestine conflict, as well as trauma and recovery. 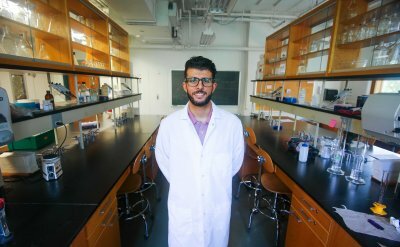 He feels like his privilege as an American citizen has shaped many of his experiences in Palestine. Carlson said that it’s difficult to see the people around him being denied basic rights. “I hope to continue work with Palestine in whatever capacity I can,” Carlson said. As Carlson has come to love Palestine and its culture, his experiences have allowed him to see Palestine beyond the conflict it is known for. The morning after Carlson arrived in Bethlehem, his neighbors—complete strangers at the time—hosted a feast. They opened up their home, serving him plate after plate of lemony olives, warm pita and crisp cucumbers. Carlson is given hope by one powerful moment from his experience. Following a particularly violent night, he attended a morning worship service next to the Israeli separation barrier in Bethlehem.